It's July and I've pulled a lot of weeds, touched a worm (yuck) and enjoyed radishes, lettuce and herbs from MY garden! The radishes are all gone now, but in the fall I'll replant them. They were in the planted where there is only dirt now. It's a small garden and I am learning! I used to grow many of these plants in pots on the back patio. They received minimal sunlight so they didn't grow very tall. Sunlight does some pretty amazing things. 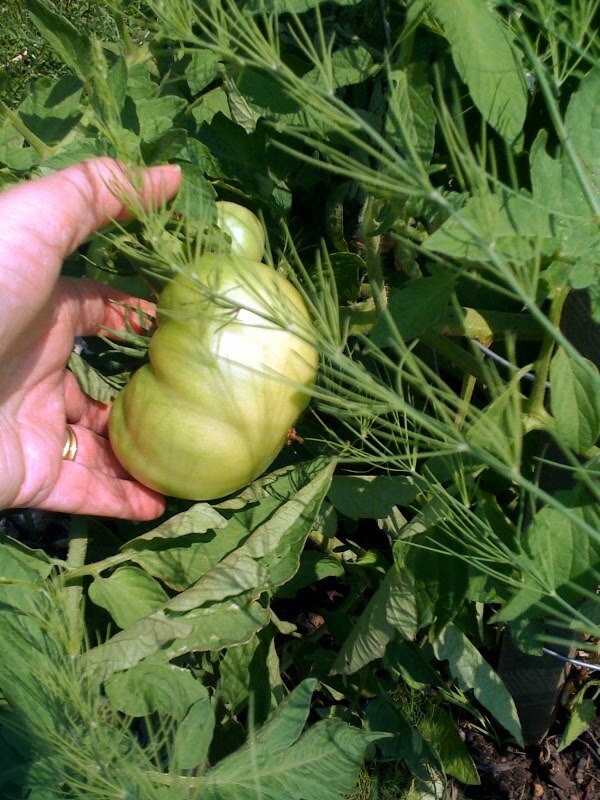 My tomato plants are huge, trying to sprawl out from their cages and they are hovering over my lavender and daises. Next year, I'll know how big they get and plant a bit differently. 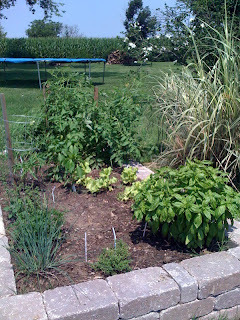 Those tomatoes are even coveting the space where my green peppers are planted! And basil oh my, how pretty and big! I think I'm going to learn how to make pesto. I can't wait for this one to turn red. BLT sandwiches on gluten-free bread of course. YUM! OH! My hand is not sunburned, I'm not sure why the camera thinks that it is. If you look close you can see the feathery leaves of my asparagus plant. I didn't know they were going to get tall either! Two more years and I can harvest them. I'm looking forward to that. Nothing tastes as good as fresh asparagus with prosciutto ( I hope I spelled that right and it isn't some kind of medical aliment!) wrapped around it and lightly grilled. It looks beautiful! And fresh veggies always taste so wonderful. You'll love the basil. It's so easy to harvest and dry. One year we planted it in a pot and when the frost came moved it to our laundry room, then we picked leaves off it all winter as it dried naturally on the stem. You can also just pick the leaves, wash and dry them, and pop them in a freezer bag. Frozen basil crumbles nicely. Last year was my first. I'm addicted. And learn new things last year. But STILL didn't leave enough room for the zucchini hogs. Those viney plants take over EVERYTHING!! Hey, I'm a big two-year veteran of the "muddy thumb!" Gotta go pick lettuce TODAY!! !